Flame, Set, Match | Alcohol and Fire. Nice Work, Everybody. 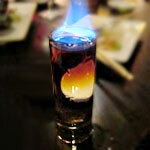 Alcohol and Fire. Nice Work, Everybody. If we’re ever going to make it out of this winter alive, we’ll need liquor. And fire. And especially liquor that’s on fire. 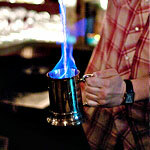 So here’s a little rundown of the city’s best flaming drinks. Mind those eyebrows, people. What it is: A tall glass of yellow Chartreuse, mezcal, Cynar and lime. That’s then topped with a sprig of torched rosemary encased in another collins glass, so the whole thing smokes when poured. Pairs with: A comfortable distance from the nearest smoke alarm. What it is: A blend of rum, hibiscus, pineapple, pomegranate and mint shaken and stirred over crushed ice, and finished with an absinthe-filled lime garnish. Oh, then they set it on fire. Pairs with: An actual Hawaiian shirt. But never wear a Hawaiian shirt. What it is: A shot of plum wine floated with Zwack, that herbal liqueur known as the “National Shot of Hungary.” Turns out, it burns just like non-Hungarian liqueur. Pairs with: Some sort of gazing-longingly-into-each-other’s-eyes situation. 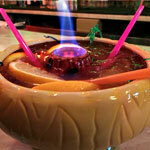 What it is: A scorpion bowl that serves two and runneth over with gin, brandy, fruit juices, five different pineapple-infused rums, a flaming floater of 151 and some plastic monkeys who are in far more danger than they’ll ever be able to comprehend. 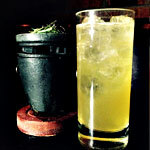 What it is: A near-mythical 19th-century drink prepared by passing boiling water and flaming scotch between two mugs to create one continuous, blue flame. 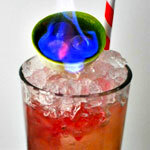 That you’ll later drink in a glass with some sugar and a date who’s completely comfortable around open flames. Pairs with: A good insurance policy.